Every so often during my visits to potential clients, I hear feedback that companies trying to compete with Southwest Greens of Ohio like to slam our green surfaces for requiring maintenance. That’s like telling someone not to buy a Cadillac because you will have to change your oil every so often! The truth is any residential green will require some attention to keep it performing at the highest levels. At Southwest Greens of Ohio, we believe our maintenance program is integral to keeping our clients satisfied and happy with the investment they have made in their backyards. We also feel that having our clients know we are invested in the long term, not just the installation phase, confirms our commitment to them and the products we employ. We know you love your golf! We do, too! Isn’t it nice to know someone like that has “got your back? We are pleased to announce that Southwest Greens and Nicklaus Design have signed a deal to remain Corporate Partners through 2011. Although we have our own in-house design team, choosing Nicklaus Design to design your synthetic green has been a great option for years while working with Southwest Greens. Please keep this in mind when it is time to build your green. When I meet with clients to talk about designing and installing their own Southwest Green, I find a lot of confusion about what they expect from the green surface and its capabilities. A lot of people picture the carpet turf of a putt putt course or the athletic turf of a football or soccer field. Nothing could be further from the truth! The on-going R&D of today’s turf manufacturers has produced materials so lifelike and durable, many times you literally need to touch the turf to find out it is synthetic. 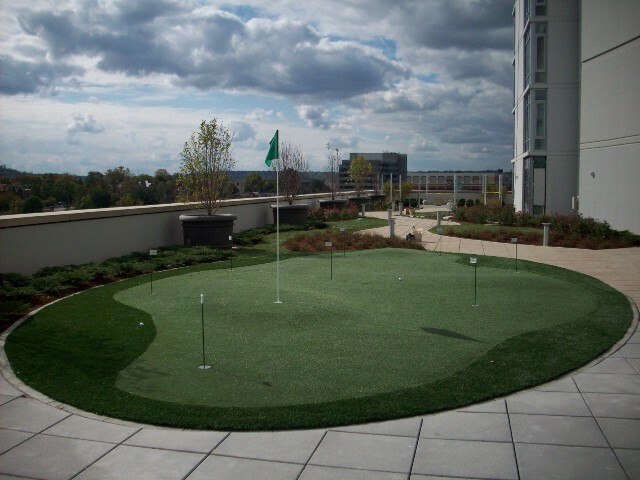 These qualities combined with our unique and exacting installation process are yielding greens that play and look like the real thing with very minimal maintenance. Our clients are always astounded to learn we can shape these man-made materials into raised tiers, grass bunkers, sand bunkers, humps and bumps, tee boxes, chipping and pitching areas, and really, just about anything you can find on a traditional golf course. And the best part is our surfaces will react just like a real green from any distance, whether it is 150 yards away or from that 30 foot flop shot your need to work on. From the PGA TOUR to the beginner, we have a Southwest Green to help you get better or just to pass some fun time with the family in your own backyard!